Versailles FFA students Morgan Heitkamp and Ross Dapore, along with Darke County OSU Extension Agent Sam Custer lead the 4-H Pledge during Thursday’s Tri-State Farm Bill Summit at Versailles High School. Moderator Ben Brown of OSU speaks with those gathered at the Tri-State Farm Bill Summit at Versailles High School on Thursday. 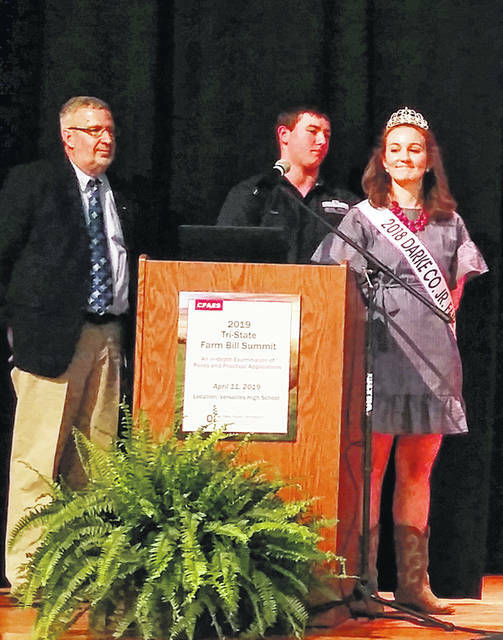 VERSAILLES – Versailles High School played host to the 2019 Tri-State Farm Bill Summit on Thursday, hosted by The Ohio State University College of Food, Agricultural and Environmental Sciences, the University of Kentucky Agricultural Economics, Purdue University Center for Commercial Agriculture, and Farm Credit Mid-America. Darke County’s OSU Extension Agent Sam Custer welcomed the more than 200 people gathered to hear details contained in the 2018 Farm Bill, which passed last fall in a 386-47 vote in the House of Representatives and by a 87-13 vote in the Senate. The bill was signed by President Trump in December. The Farm Bill, which is approved every five years, allocates billions of dollars in subsidies to farmers. On Thursday, three guest speakers presented information, including Keith Coble, a Giles Distinguished Professor and head of the Agricultural Economics Department at Mississippi State University; Jonathan Coppess, a native of western Ohio, who is director of the Gardner Agricultural Policy Program, director at Bock Agricultural Law and Policy Program and clinical assistant professor at the University of Illinois; and Patrick Westhoff, director of the Food and Agricultural Policy Research Institute and a Howard Cowden Professor of Agricultural and Applied Economics at the University of Missouri. Coble discussed crop insurance, with Coppess sharing perspectives on farm conservation policy, and Westhoff discussed changes and choices with the Farm Bill’s commodity programs. “The Farm Bill literally touches all Americans,” said Ben Brown during his remarks as moderator for the evening. Brown, who is with The Ohio State University’s Agricultural, Environmental and Development Economics program explained the Farm Bill “is a large comprehensive bill” detailing policies concerning farm loans, insurance, conservation programs, and Title 1 programs, including two crop commodity programs introduced in the 2014 Farm Bill —Price Loss Coverage (PLC) and Agriculture Risk Coverage (ARC). One new policy in the 2018 Farm Bill is the legalization of hemp. Coble concluded his remarks stating the country would have “to find new uses for hemp due to the ingenuity” of the American farmer. 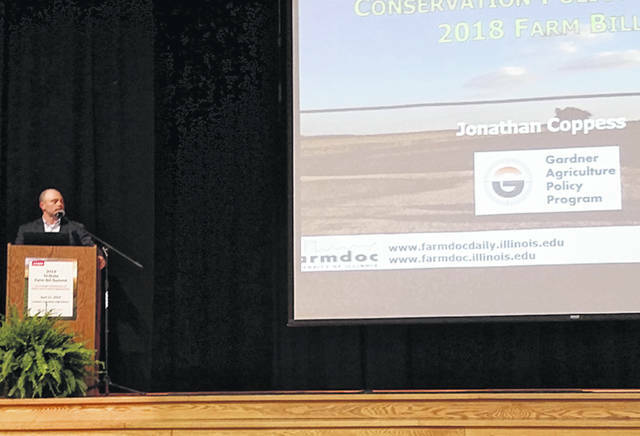 Coppess discussed moves being made by U.S. farmers in the area of conservation and the environment. The Farm Bill includes policies concerning wetland management and water quality programs. Westhoff’s presentation included information charting the past five years’ ALC and PLC initiatives. Also participating in the summit were Versailles High School FFA students Morgan Heitkamp and Ross Dapore, who led attendees in the Pledge of Allegiance and the 4-H Pledge. The FFA Creed was recited by Mallary Caudill, a student at West Liberty-Salem High School in West Liberty, Ohio. https://www.sidneydailynews.com/wp-content/uploads/sites/47/2019/04/web1_farm-bill-1.jpgVersailles FFA students Morgan Heitkamp and Ross Dapore, along with Darke County OSU Extension Agent Sam Custer lead the 4-H Pledge during Thursday’s Tri-State Farm Bill Summit at Versailles High School. https://www.sidneydailynews.com/wp-content/uploads/sites/47/2019/04/web1_farm-bill-2.jpgModerator Ben Brown of OSU speaks with those gathered at the Tri-State Farm Bill Summit at Versailles High School on Thursday.